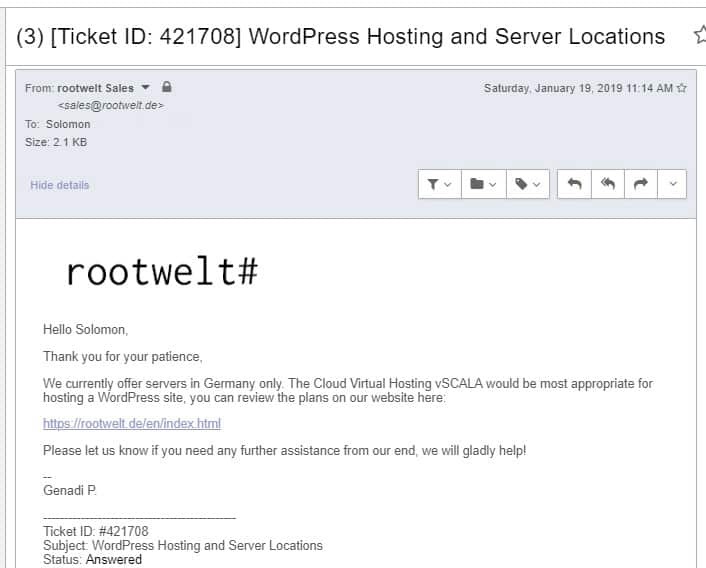 Rootwelt Review 2019: Is Rootwelt a Good Hosting? German hosting company Rootwelt was founded in 2013. Its highly qualified staff have years of hosting experience and are committed to delivering fast and reliable cloud virtual hosting solutions to individuals and businesses in Germany and beyond. In 2013, startup hosting company Rootwelt (“Rootworld” in English) was formed from the joining together of European hosting providers. With a combination of a highly qualified team and modern hosting infrastructure, this company is able to offer reliable VPS solutions targeting businesses of all sizes across Germany and elsewhere. The Rootwelt website can be switched between the Russian, English and German languages. Rootwelt uses reliable Tier 3 compliant data centers with redundant network links, modern IT infrastructure, and SSD servers. 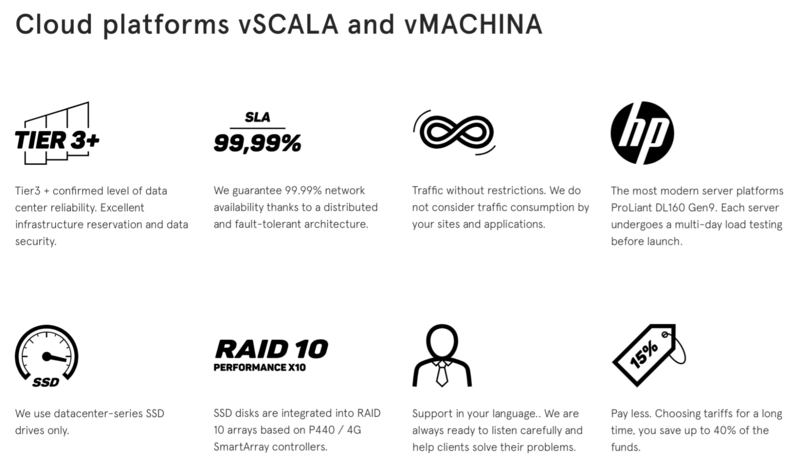 Its “vMACHINA 1024” cloud VPS starter package comes with 1 GB RAM, 20 GB SSD disk space, and 1 CPU core. At the other end of the scale, the “vMACHINA 8192” pro package includes 8 GB RAM, 160 GB SSD disk space and 4 CPU cores. There are no traffic restrictions on any of the cloud VPS solutions offered by this vendor. All of Rootwelt’s hosting solutions can use either Linux or Windows operating systems. You can choose from the latest releases of CentOS, Debian, Ubuntu, and Windows Server 2012R2 / 2016 at no additional cost. Rootwelt performs regular data backups to prevent data loss in case of a disaster, but this backup service incurs additional costs. Rootwelt’s hosting plans are quite cheap because the features are quite basic. Customers can choose between four billing cycles: 1 month, 3 months, 6 months, and 12 months. The packages come with discount coupons that give deeper discounts for longer commitments. There is a 99% uptime guarantee, but this is not backed by any compensation plan. What makes Rootwelt stand out from the German web hosting crowd is its well-designed VPS solutions. This company has grown considerably during its five years in business and has the potential to become a preferred hosting provider in Germany and the rest of Europe. Wondering how Rootwelt stacks up against other Web Hosting companies? Enter any other Web Hosting company and we will give you a side-by-side comparison.